Contour along jaw, temples, and under chin and jawline (along neck). Highlight bridge of nose, apples of cheeks and top of forehead, at hairline. Apply blush right on cheekbones. Contour along your entire hairline at top of forehead, hallows of you cheeks (make a “fish face” to find), and bottom of chin. Highlight above cheekbones (a little higher than where you put blush). Contour temples along hairline, and bottom of chin. Highlight just below hollows of cheeks down to jawline. 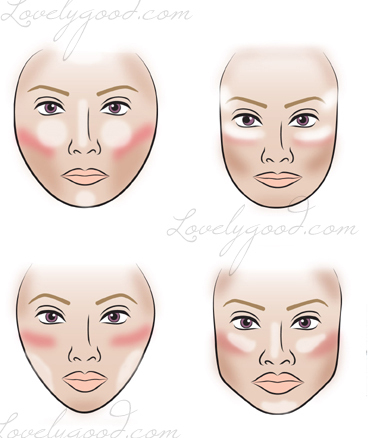 Apply blush on cheekbones from hairline blended to just before apples of cheeks. Contour jaw and and temples along hairline. Highlight bridge of nose, apples of cheeks and centre of chin. This is great!! I have a heart-shape face. I’m curious, what product do we use on the hollows of our cheeks? And do I use a bronzer on my hairline and under my chin? Thank you for your helpful tips!